1-Lighter Can Be Brought On Flights With You! Minimalist and Stylish Design. Great for Cigarettes,Cigars,Camping,Indoor and Outdoor emergency,Sitting at the bar,or Playing Cards at the Casino! 2-Double Arc design - Fast light cigarette in ONE SECOND only. Easy to use - Lights up at the click of a button. Safety Feature - will not light up so long as the secure lid is closed. 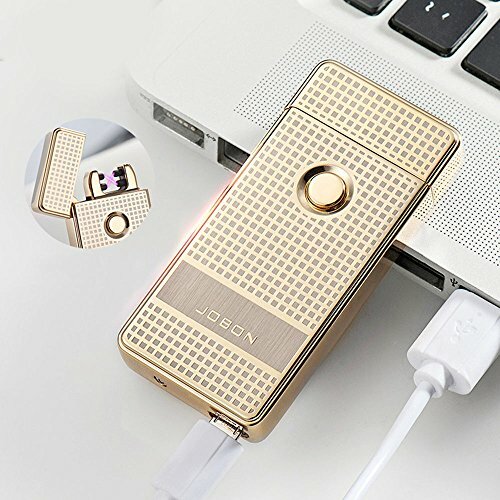 3-After 2 hours full charge lighter can be used up to 500 times. Windproof,No flame,No butane,No hassle,No problems.Reliable,Reusable,Rechargeable. Great alternative to Zippo, Bic, or Clipper brand gas filled lighters. 4-Made by the Largest Smoking Sets Manufacturers -- JOBON brand,provide Life-Time Warranty! 5-Humanization design with Cleaning Brush and Gift Box.Exquisite and High Grade.Perfect Gift choice for Business or Love Family. If you have any questions about this product by Jobon, contact us by completing and submitting the form below. If you are looking for a specif part number, please include it with your message.